MRMIKKI is designed to develop a powerfuland efficient ceramic space heater. Quick Heat function can warmup in 3 seconds as it offers a wide range of adjustabletemperatures levels with the knob control for 2 heat settings: 1200W/700W. Equipped with tip-over safety switch andoverheat protection. MRMIKKI ceramic space heater will disconnect if it istilted or tipped under the tip-over switch. 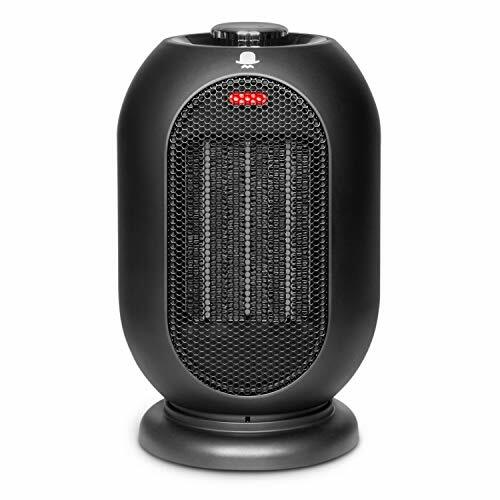 Moreover, the MRMIKKI ceramic spaceheater will automatically shut off if there is an overheat situation under theoverheat protection. At the push of single knob control you canswitch heating modes easily. With the portable design, this allows moving theheater between two different rooms conveniently. Moreover, its small size makesit a good option for a desktop or bedside table to fit your space. Aside from low and high heat settings, our fansetting also allows you to enjoy fresh air in all seasons. 1. The fan would keep running for about 10seconds after tipped over or turned off due to inertia - please do not mindthis function as it will switch off afterwards. 2. Please confirm the safety switch on the rearbottom is on otherwise the device won't turn on even if you press the On/Offbutton on the top. Powerful and Quick Heat - Quick heat in 3 seconds to warm the air around you. Easy adjustable thermostat controls and 2 heat settings: 1200W/700W to offer most suitable heater for you. Adjustable Head to Offer Wide Range Heat - The heater offers oscillation tilt head for a wide area coverage. One button to activate swing mode to direct air up towards your preferred area. Safety Design Protect Your Every Use - Offers safety features including a tip-over switch and overheat protection. With double protection, it ensures your every use safely. Portable and Compact - Product has a compact design with a handle for space saving and portability. Perfect for everyday use in home or in your office. 1-Year-Warranty and Lifetime Technical Support - We offer 1-year hassle free warranty for all orders placed through Amazon Store - FirewoodDirect, with great value-for-money quality, enjoyable customer service, and professional technical support that are handy yet free. If you have any questions about this product by MRMIKKI, contact us by completing and submitting the form below. If you are looking for a specif part number, please include it with your message. © 2019 - kxsh365.com. All Rights Reserved.